We have been so blessed. Our little family enjoyed such a wonderful Christmas with extended family. We have been eating and visiting and eating. It's been wonderful! blessed to have people to visit with and food to eat. There does come a point, however, where the eating catches up and the pants get tight. After a week of basically sitting and talking and, yep, eating. 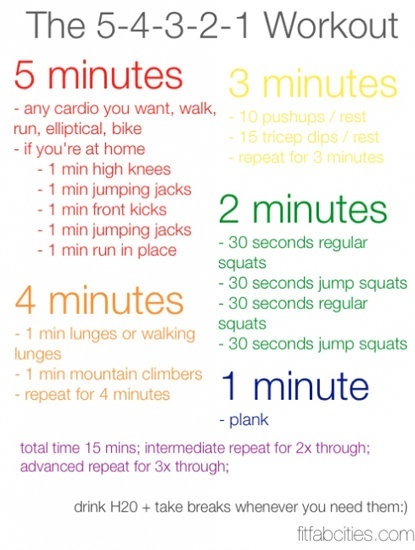 I decided to find a quick workout that I did tonight (ahem, to make room for scalloped potatoes for dinner, ahem). It was 15 minutes total and I worked up a sweat. The pace was fast and 15 minutes was up in no time. If you feel the need to make room for your next meal, try this one and let me know what you think of it. I found it on Pinterest. 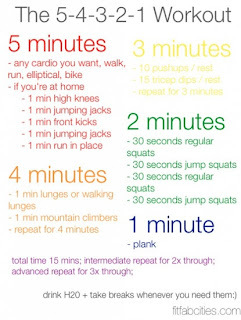 I'm also going to try a couch-to-5km goal starting next week. I'm just looking for a free app for my android tablet to help me with the timing. I thought I'd try it running on the spot if I can't get to the gym that night. I figure anything is better than nothing! I really need to focus on calories out being more than calories in. Do you know of a good c25k android program you can recommend? Hope you and your family had a joyous Christmas.